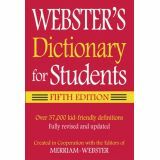 Webster's Federal Street Press Book Dictionary is completely revised and updated. This North American edition contains Canadian words and spellings with 37,000 definitions. Word list created specifically for Grades 3-6. 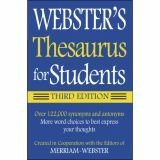 Webster's Federal Street Press "Thesaurus for Students 3rd Edition" has 352 pages and is perfect for students grades 6 and up. It is a priceless writing skills tool and makes finding expression words easy. This book features 122,000 synonyms, antonyms, and related words and is alphabetically arranged.